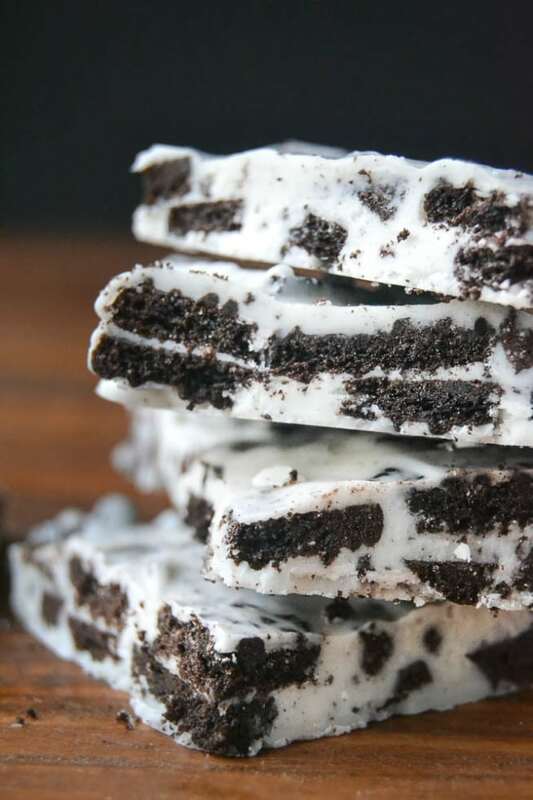 Cookies and Cream Bark ~ just two ingredients and a few minutes is all it takes to make one of the tastiest and most giftable homemade chocolate desserts around. Chocolate bark is officially the easiest homemade candy project on the planet. 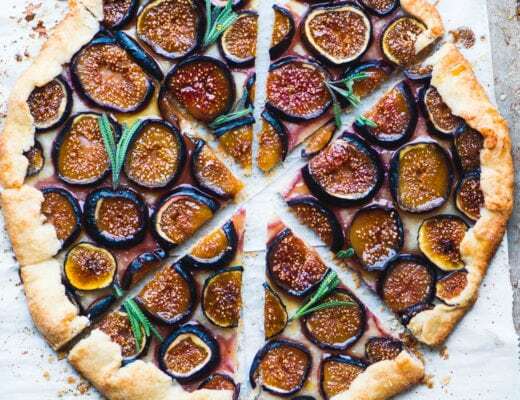 There’s no mess, there’s no oven or stove time, it’s quick, and absolutely delicious. I always turn to this easy chocolate bark when I need a last minute holiday gift or dessert; you can’t go wrong because barks are basically just customized slab-candy bars…who wouldn’t go crazy for that? 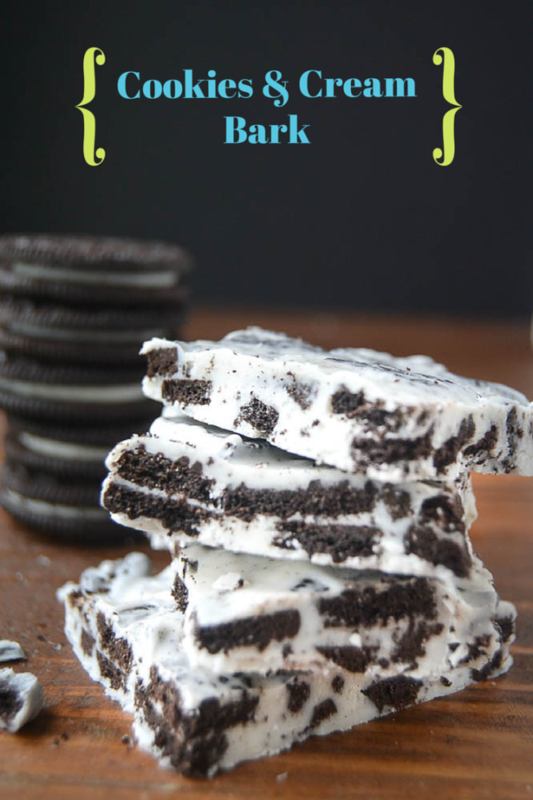 This version is especially good, I think, because of the pretty contrast between the crushed Oreos and the milky white chocolate. Whenever I make something this simple, I usually say “be sure to use good quality ingredients”, but here’s a secret — for this bark I used white ‘candy coating’ instead of pricier white chocolate, and guess what? The flavor matches the Oreo filling perfectly, and it was the ideal choice. Another thing I like is that the color of the candy coating is pure white, while good quality white chocolate can be yellowish. So if you’re someone who doesn’t love the flavor of real white chocolate, try this, it has a cleaner taste that you might prefer. A couple of tips help make this bark a success — I cut the cookies into pieces instead of crumbling or crushing them. This helps maintain their integrity and crunch in the finished bark. Also, I fold my cookie pieces into the melted chocolate very gently to preserve the black and white look. Mix it up too thoroughly and everything will go greyish. If you are using a bar of candy coating, chop it in small pieces. Put the coating, or the chips, in a microwave safe bowl and microwave for one minute. Stir the chocolate and then microwave again in very short 15 second bursts to completely melt it. Stir in between and let the heat in the bowl do some of the work. Don't over do the microwave or the chocolate will seize up into a solid mass. Keep stirring until all the little lumps are melted. 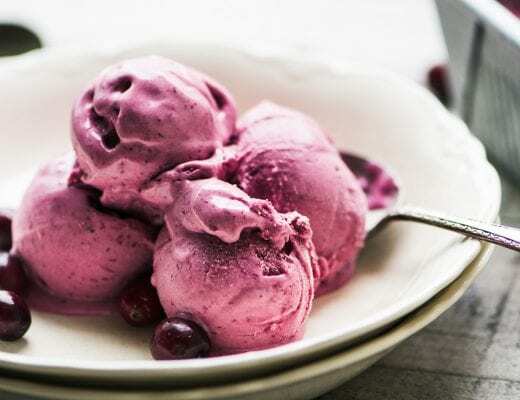 2-Ingredient Dessert Recipes That Will Satiate Your Sweet Tooth | Ridiculously Pretty! I’d love to make this for teachers Christmas gifts. 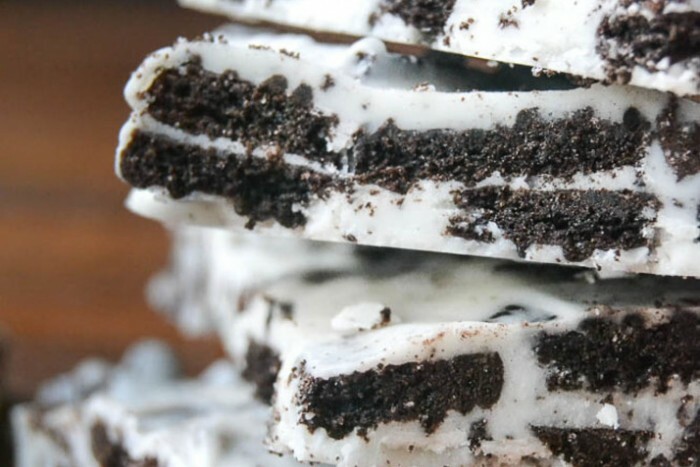 Do you take the cream filling out of the Oreo, or leave it all together? I leave it all together, Lindsaye, it’s wonderful! Chocolate Bark Candy Recipes - Chocolate Chocolate and More! 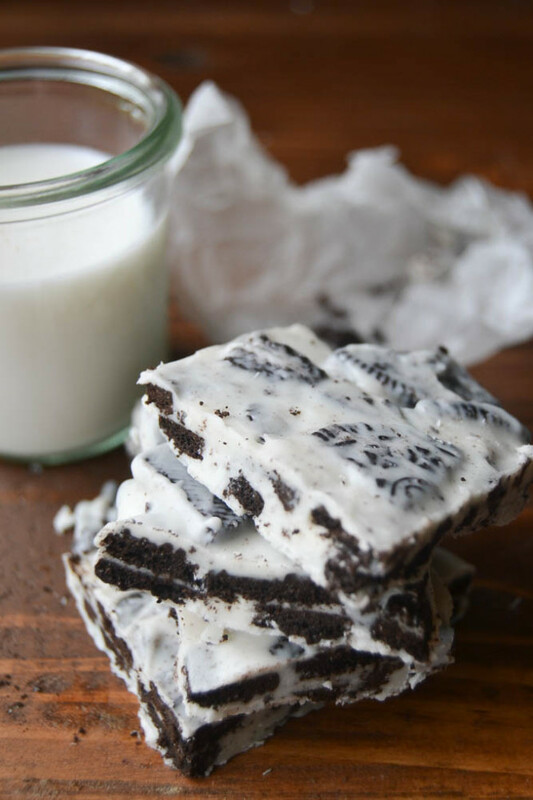 I love making bark at Christmas and this cookies and cream variation looks irresistible! Bless you—-this really is easy. I LOVE Oreos. I rarely eat them. But this would give me a most excellent excuse to bring a bag into the house! That was the ONLY problem with this recipe…I have (had!) a half bag of cookies left, and they went pretty quick. Such a creative idea Sue, never know what you will come up next. 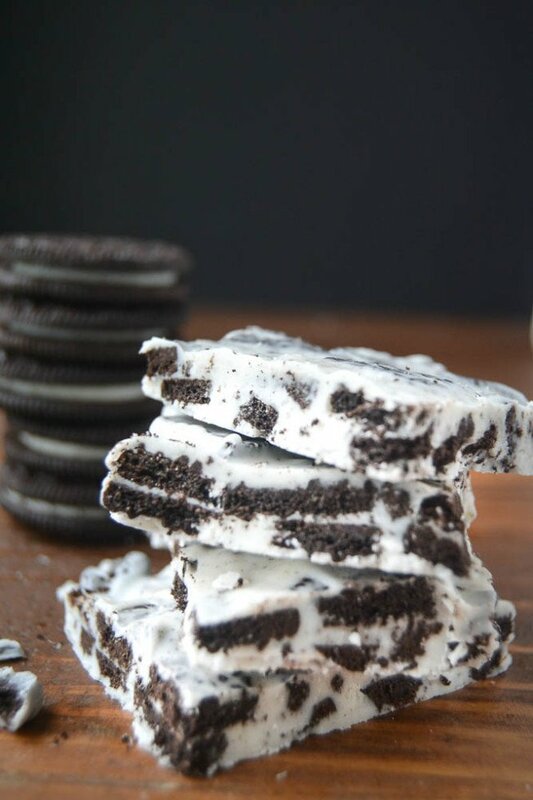 I have some big Oreo fans in the family, they would love this!!! That would look really pretty, because the pattern on the cookie shows through the veil of chocolate! Wow, I have never tasted any kind of bark, it’s not as big over but hubs loves oreos. It’s about the easiest thing you can make, Tabitha — so definitely do it for him! 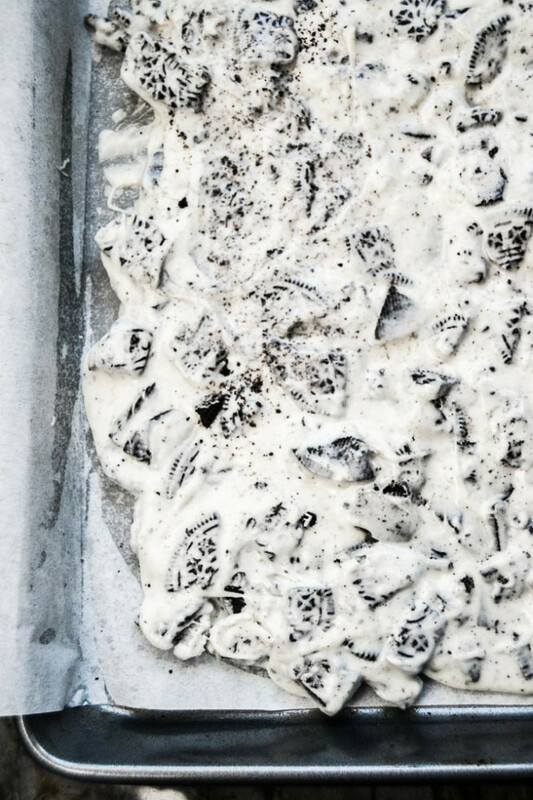 This cookies and cream looks phenomenal! It reminds me of the time when Hershey’s still made their cookies and cream bars. 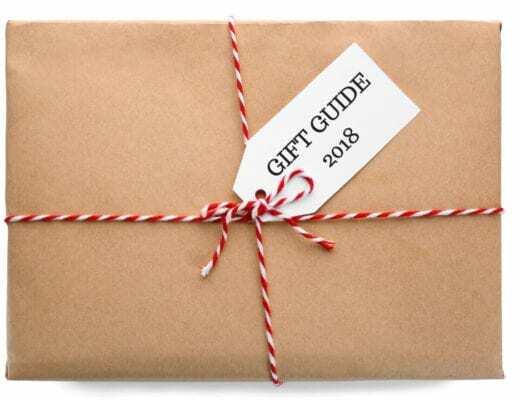 They’ll make such great gifts! I think they still do make them, at least I saw them recently at my supermarket! Brand name on your white chocolate please….there is great variance of quality I believe in the different brands. thank you. Sure Leslie, mine was actually the store brand from my supermarket, Ralph’s. I will say that with confectionery coating there isn’t as much variation as with actual white chocolate, so I think you are safer trying whatever brand you can find at your store. This would be perfect for Christmas. Very indulgent! I’m loving this bark! The cookies and cream combo is perfect!! !